Is calcium the only answer to stronger bones? No, you also need the right combination of nutrients such as phosphorus, magnesium, zinc and vitamins C and D found only in NESVITA CALCIPLUS milk to keep calcium inside bones. Can we slow down bone loss? Yes, we can with NESVITA CALCIPLUS milk. It's scientifically-formulated with CALCILOCK to keep calcium inside bones. Can bone loss be reversed? No, bone loss is natural process of getting older. 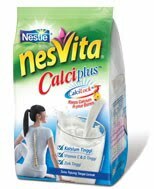 But you can slow it down with NESVITA CALCIPLUS milk with CALCILOCK formulated to keep calcium inside bones.